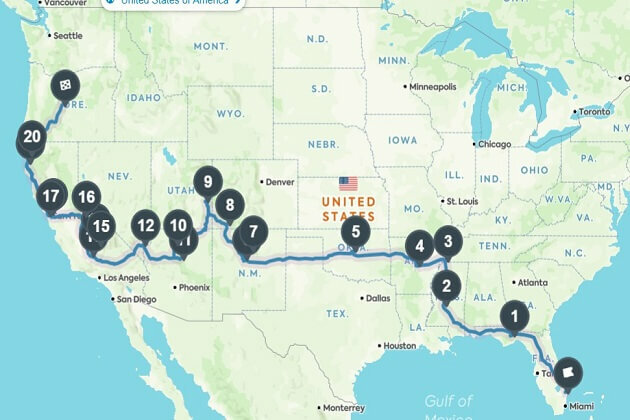 While most of my moves over the past 15 years have been short distances across Florida and Georgia, my cross-country move from Florida to Oregon and back again were about as far from each other as you can get within the U.S., about 3,000 miles to be exact. 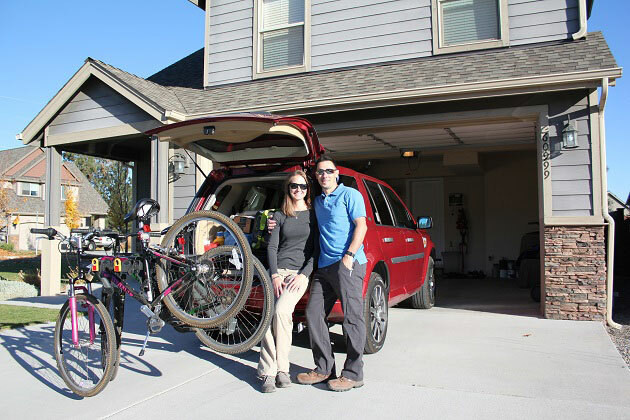 Preparing for a cross-country move can take some time, but it doesn’t have to be stressful. Based on my experiences and what has and has not worked, I have created a guide for moving across the country for you! Check it out and leave a comment below if you have any questions! This may seem like a no-brainer, as most people don’t just pick a spot on a map and move there. Instead they are usually moving for a new job opportunity or transfer. However, when we moved to Oregon that’s exactly what we did…we picked a place on a map and moved there. Once we made a list of our criteria, we narrowed our list down to a few towns within Colorado, California, Wyoming, Utah, and Oregon. Bend, OR met everything on our list of the kind of place we wanted to live and when we visited we fell in love. So, we planned our move to Bend, OR in January 2015 and made the move from Florida in March 2015. The timeline from the date we decided to move to Bend and the day we left Florida was about 5 weeks. Another reason people often move is to be closer to family. This is the case for us with our second cross-country move. After spending over 2 years in Oregon we decided to move to Florida to be close to our family. It was a tough decision because we love Oregon (you can read about some of our favorite Oregon adventures here, here and here) but decided that at this point in our lives the people we are near are more important than the places we live. Once you have decided what town you’re going to be moving to, you need to find a place to live. I recommend finding a rental home or apartment first before considering to buy a house, so you can get a feel for what areas of town you’d like to live in long-term. With the internet, it is pretty easy to find a place to rent. Stay away from websites like Trulia or Hotpads because there are a lot of scammers on those websites and the listings aren’t updated in real-time so you may be looking at a home to rent that is no longer available. Instead, google your town + property management and find some local property management companies to reach out to. They will likely have some listings available to browse on their website, plus you can call and talk to a real person about what you’re looking for. Do you need a furnished or unfurnished place? Once you have decided or know where you’re going to be living, you can schedule your move. Downsizing and getting rid of your clutter is always a good thing, especially when you are moving. The more stuff you move, the more you pay so it’s best to get rid of all your extra junk before you make the move. One of the best ways to sell your things online is to use local Facebook groups and the Facebook marketplace. Join the local facebook swap shops by searching for groups on facebook using your current city + “swap shop”, or “buy, sell, trade”. You can post your items for sale at whatever price you’d like, there’s no commission or fee to pay and you set up the meeting time/place with whoever is interested in purchasing your item. I have tried other Buy/Sell apps like OfferUp and have sold a few things using them, but Facebook has been the most successful for me when it comes to selling used items. The things that sell the best are furniture, electronics, kitchen items, and sporting goods. Clothes don’t seem to do well on Facebook, but for name-brand clothes I recommend the app Vinted. They take a commission of course, but it’s very easy to use. If you have a collectible or high-dollar item you may want to consider eBay. Go through everything in your house and garage and make a pile of all the items you want to get rid of, keeping clothes in a separate pile. Take good quality pictures of all the items on your smartphone. Take 2-3 pictures of each item showing details, flaws, or different angles. Post your item on the platform you choose using the app…Facebook, Vinted, eBay, etc. and set your price. Give your item about 2 weeks to sell…some things go the very same day you post it and others take weeks. It is hard to predict what items will sell the fastest. After 1 week with no interest, lower the price. Set up meetings to complete the sale as soon as possible. If you wait too long it is more likely the person will change their mind or forget about purchasing the item. Have some cash on hand for your sale meetings in case they need change. Set aside all the cash from your sales for your move. Once you have made an attempt to sell as many of your things as possible, pack up the remaining items and take them to your local Goodwill or Donation Center for donation. Unless you have a piece of furniture or high-dollar electronic item, I would not waste your time at a pawn shop or thrift store. Sometimes it’s better to make the donation and forget about it. Each time we moved across the country we made about $1,000 selling things we no longer wanted/needed. It helped to lighten the load and help with the moving expenses. Are you going to drive your stuff across the country yourself (i.e. in a Uhaul) or are you going to hire a moving truck to drive your stuff for you? Are you bringing all your furniture? Are you driving a car across the country or do you need that shipped too? What is the weather going to be like at the time of the move? Are you going to pack and load your stuff yourself? 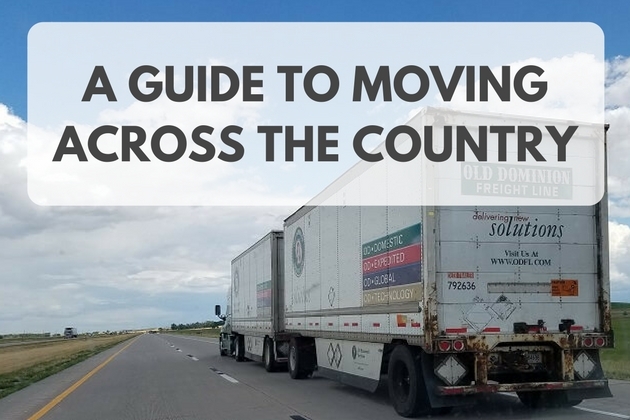 While you can save some money by hiring a moving truck (like Uhaul) and driving your stuff across the country yourself, you also have to deal with the hassle of driving a moving truck across the country. Plus, if you’re bringing your own car it means you would have to get that transported anyways. 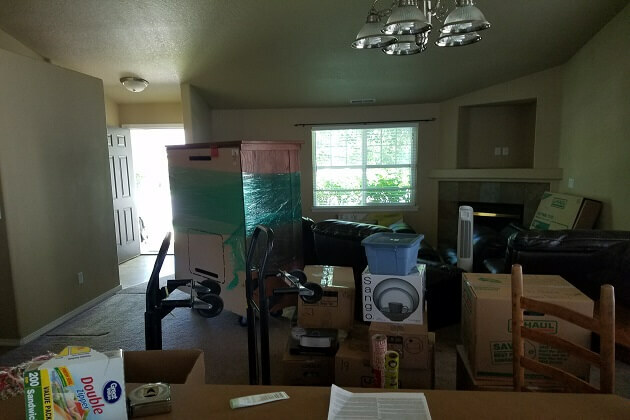 What we did for both moves, and what I recommend, is hire a moving company to move all our stuff in a truck, and drove our own car across the country (we got rid of our second car before moving). This way we were able to be comfortable in our own car for the roadtrip and allow the professionals to drive our things. This makes for a more fun move (see #6 below). If you’ve decided on the u-drive method then you’ll want to get a quote for the truck you’ll be driving based on size (to fit the stuff you’re bringing) and the mileage of your move. It wouldn’t hurt to get a couple of quotes from at least 2 different companies and check out their reviews online first. If you’ve decided to hire a company to move your stuff for you, contact at least 2-3 companies to get quotes. Depending on the time of the year and state you’re moving to, the moving quote can be extremely variable. For our move from Florida to Oregon I got an in-home estimate from Wheaton, North American Van Lines, United, and Suddath. For the quote, an agent will come to your home and calculate the stuff you plan to move (based on weight), as well as the distance of your move to come up with the quote. You also want to verify that they are available on the date you wish to move. North American ended up giving us the best quote (about $3800) and that’s who we ended up using. I picked up boxes at the local moving company for North American and did all the packing myself for two days leading up to our move date. Then, on the day of our move, two guys loaded all the boxes and furniture into the truck. This was the most overwhelming part of the entire move for me because packing took some time. I used a lot of bubble wrap, towels, and blankets and only had one plate broken by the time our stuff reached Bend about 14 days later. For our most recent move from Oregon to Florida I got an in-home estimate from North American, United, and Mayflower. I found out that it was pretty pointless to get a quote from United and Mayflower because they are owned by the same company and their system and quotes were exactly the same. This time around North American was the highest and all the prices from these companies were significantly higher than our first move (about $8000!). We even had less stuff this time. I learned that there are some states that are more expensive to move from than others and the time of the year makes a difference too (summer is high-season and therefore more expensive). So, we opted out of the full-service companies for this move and contacted some u-pack companies instead. 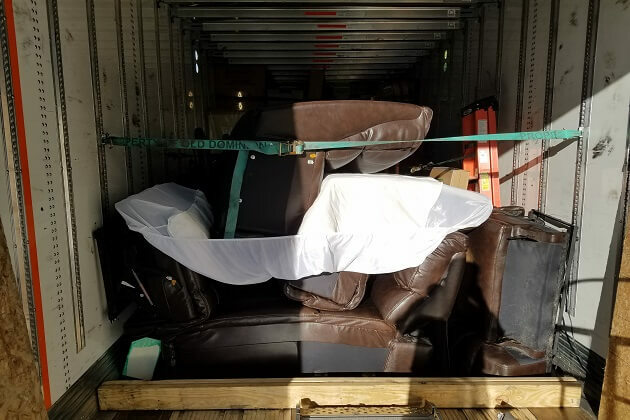 U-pack companies are companies that provide you with the truck or container to pack yourself, then they pick it up and drive it to your new location for you. They do NO PACKING OR LOADING so it’s all up to you. I got a quote from a company called Zippy Shell and Old Dominion. Old Dominion had the best quote (about $3000) and were the easiest to work with. For these companies, the price is dependent on how much space you use in feet (versus weight) and the distance of your move. We actually spent less on our second move than our first going this route. 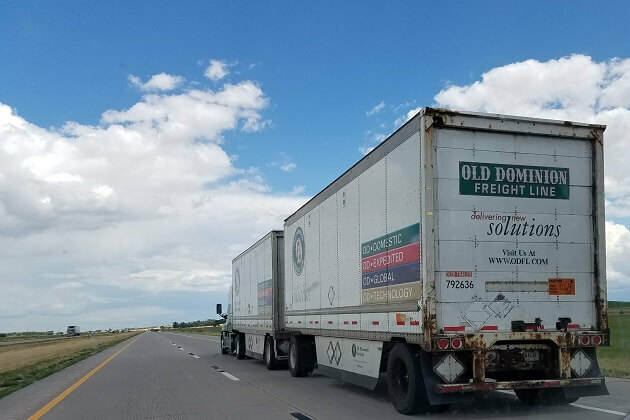 So, on the day of our move, Old Dominion dropped off our container, we packed it with the help of two guys, and called Old Dominion to come pick it up the next day. Then it arrived in Florida at our place about 13 days later, perfect timing for us coming in from our roadtrip. I also make sure to make a list of what will be coming in the car with us for the cross-country roadtrip before packing all our boxes to make sure we don’t pack anything we need to bring with us. After 3 cross-country roadtrips, I have found that less is more. A packed car can get pretty annoying if it’s your home for two weeks or more. 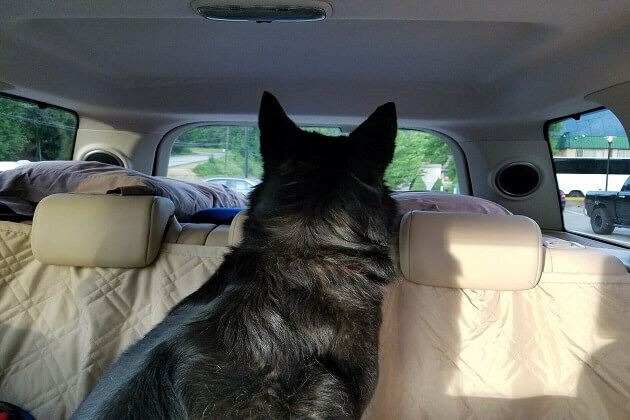 Be sure to check out this post for tips about traveling with dogs. Between the two cross-country moves and an extra roadtrip from Oregon to Florida to visit family, I have driven across the country with my husband and two dogs 3 times. Each trip has been different and we have definitely made them an adventure. 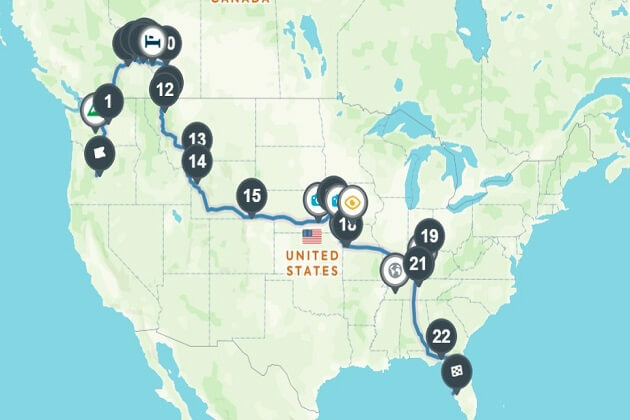 If you’re planning to move across the country, I recommend giving yourself at least 14 days to do a good roadtrip instead of torturing yourself by trying to get there fast. Before you leave for your trip, plan out your route to make the most of your time. Be sure to take the weather into consideration when planning which part of the country you plan to drive through, and don’t feel like you have to stick to the route 100%. Instead, use it as a guideline and be flexible along the way. 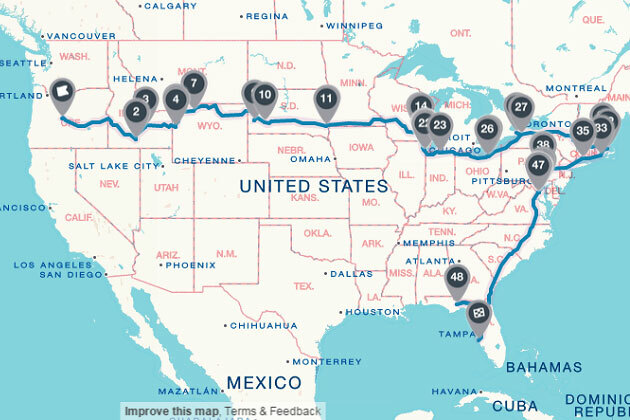 For more information about planning a roadtrip, be sure to check out this, this, and this post for ideas and advice. Moving across the country can be exhausting, scary, and emotional, but it is also fun, exhilarating, and exciting! For me, I am so glad we did it the first time, I’m glad we did it the second time, and there is a very good chance we will do it again once we get tired of the heat of Florida (I may or may not be already planning the next move…just kidding…maybe). My advice would be to make the most of it, experience a good roadtrip and get out there and explore your new city when you get there! Have questions? Leave a comment below and I’ll help ya out! 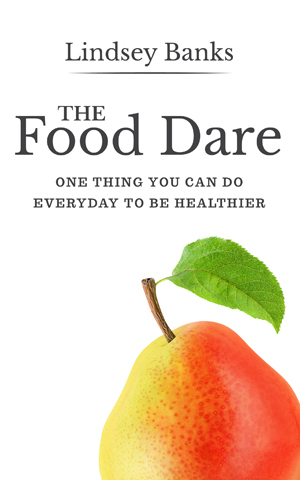 Each month I round up my favorite food and fitness tips, including any fun adventures I recommend and gear I’ve tested, and send it straight to your inbox. Good luck on your move! A little over 3 years ago we moved from Philadelphia to Anchorage, Alaska! It was hands down the craziest thing we’ve ever done. We secured a temporary tourism job that had housing, packed up a U-Haul trailer, and spent 8 days driving up there. It was cheaper for us to drive our stuff up instead of shipping it up (especially with car shipping costs), plus it was a fun adventure. Once we were up here we just interviewed for full time jobs and toured different apartments so that we were ready when the tourism job ended. We love it! I really think it’s cool that you guys just picked a place on a map and moved there. That’s such a brave thing to do! That’s awesome Kristen! I love Alaska and can see why you’d want to move there! Hi there! 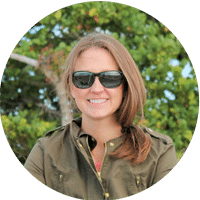 I’m Lindsey Banks, founder of Fit Life Pursuits, wife, dog mom, outdoor adventurer, and fitness guru currently living in Bradenton, Florida. 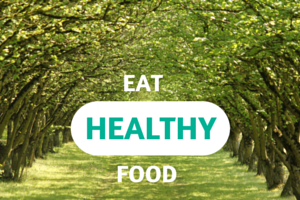 I am here to challenge you to pursue the healthy, happy, and adventurous lifestyle you want. I hope you will stay awhile! Be sure to sign up below to get free updates from me.